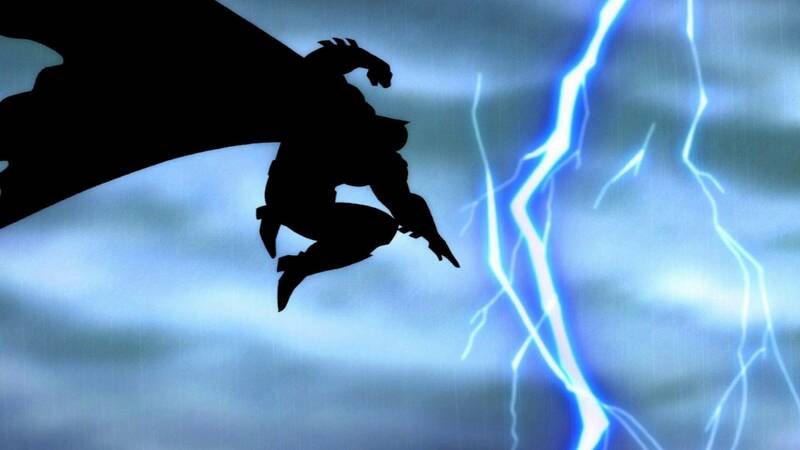 In preparation for Frank Miller’s return to Batman comics in The Dark Knight III: The Master Race, I decided that it would be the perfect time to look back at one of the defining graphic novels of its time, The Dark Knight Returns. A book of epic proportions TDK not only redefined Batman for a generation, going on to influence Batman in all mediums but also cemented Frank Miller’s reputation as one of the greatest graphic novel writers of all time. Before Miller trashed his career that is. So let’s get straight into The Dark Knight Returns. The Dark Knight Returns is really three stories in one; the battle with the mutants that hold Gotham; the clash with Batman’s rogue gallery and the fight with Superman. As you’d suspect, there is a lot of fighting throughout the book (both figuratively and intellectually). However, this is part of the power of the book. The theme of the fight to change things is sparked by Bruce Wayne’s realisation that following his retirement as Batman, Gotham has become an even worse cesspool than before. Bruce must fight to not only reclaim his city but also his purpose. Throughout the opening section of TDKR, Wayne shows a sense of despondency and rejection of the world in a similar way to how he felt at the beginning of Batman: Year One. Only when he remembers the horror that made him Batman in the first place does his mission to return to Gotham and bring about justice one more. The internal fight within Batman is also shown in the fight that he has with his advisories. During the second part of the book, in which Batman faces off against Two Face and The Joker we once again see how there is a conflict going on within each of the characters. The Joker’s own battles is between hiding his true self so he can be released back into the community and continue to commit atrocities, Two Face’s conflict is more interesting though. Two Face believes that he still is the same criminal that he was before even though his face has been repaired. The fight that goes on within Harvey Den is a fight between the medical rehabilitation that he has been given and his deeper and darker inner feelings of pain is something that is not only a metaphor for Batman’s own struggle but also Gotham’s struggle for unity. The final section includes the infamous Batman v Superman fight but the most interesting part about that and one that runs throughout the book from Batman’s return to the end, is the battle of ideologies. 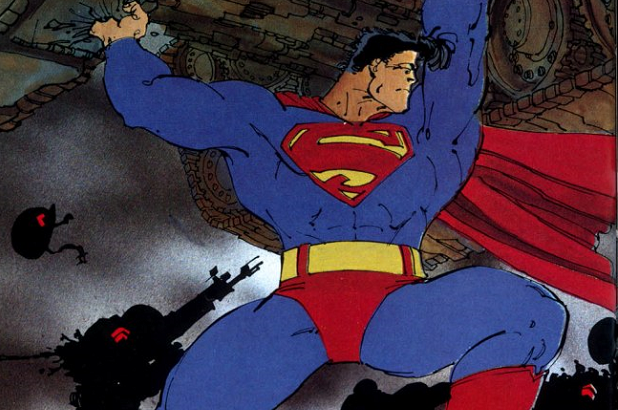 Superman sees that the only way he can protect his adopted homeland is to agree to the government’s demands and perhaps sacrifice some of his own self to save America; he knows that if he disagrees with the government then he’ll be useless and not be able to help make sure America is saved via the only way he knows. Batman, on the other hand, resents the idea of being pigeon holed so he feels that he must break out against the oppressive regime. Miller rather skilfully writes the scenes in which Batman and Superman face off against one another (even though at times Miller seems to be adding in vague jibes about Superman just because he doesn’t like the character) right up until the epic conclusion of their duel. The artwork is truly awesome with Miller and Klaus Janson providing some epic material. Iconic scenes such as Batman fighting Superman; the famous “lightning strike” pose and Batman’s fight with the Mutant leader are all made memorable with the slick and satisfying artwork. While occasionally the human proportions look a bit off this is made up for by the fantastic iconic art. The Dark Knight Returns is, even with its odd fault, a fantastic and dark novel which takes the dark image of Batman and makes it even darker. With snappy dialogue and slick art it truly is one of the greatest graphic novels of all time. Its sequel on the other hand, well that’s a different story. Next time as we continue the run up to the release of Master Race we look at the horror that is – The Dark Knight Strikes Again.